What is the RMieS-EMSC package? 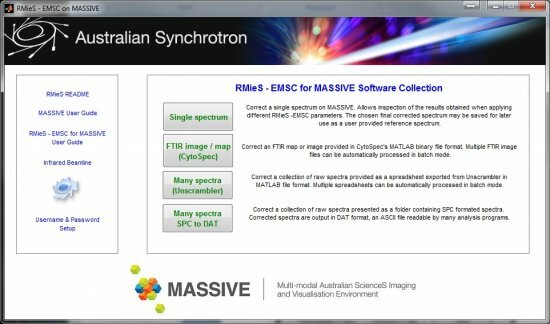 RMieS-EMSC for MASSIVE is a software package developed at the Australian Synchrotron to provide a user friendly interface to use the RMieS-EMSC algorithm and to initiate RMieS-EMSC compute jobs on the Multi-modal Australian ScienceS Imaging and Visualisation Environment (MASSIVE) High Performance Computing cluster. Please note, we do not distribute copies of the core RMieS-EMSC algorithm but instead provide an easy way to utilise the algorithm for our beamline Users. If you have only a relatively small number of spectra to process or you require a copy of the core algorithm then we recommend you obtain RMieS-EMSC for MATLAB directly from the algorithm’s Authors. They may be contacted by email to: peter.gardner@manchester.ac.uk. The RMieS-EMSC algorithm itself was developed as the result of a research collaboration between the University of Manchester, UK, Dublin Institute of Technology, Dublin, Ireland and Nofima Mat, UMB, Norway (Bassan et al., 2010). P. Bassan, A. Sachdeva, A. Kohler, C. Hughes, A. Henderson, J. Boyle, J.H. Shanks, M. Brown, N.W. Clarkee and P. Gardner, FTIR microscopy of biological cells and tissue: data analysis using resonant Mie scattering (RMieS) EMSC algorithm, Analyst, 2012, 137, 1370. P. Bassan, A. Kohler, H. Martens, J. Lee, H. J. Byrne, P. Dumas, E. Gazi, M. Brown, N. Clarke and P. Gardner, Resonant Mie Scattering (RMieS) correction of infrared spectra from highly scattering biological samples, Analyst, 2010, 135, 268. P. Bassan, H. J. Byrne, F. Bonnier, J. Lee, P. Dumas and P. Gardner, Resonant Mie scattering in infrared spectroscopy of biological materials - understanding the ‘dispersion artefact’, Analyst, 2009, 134, 1586. How do we access the RMieS-EMSC package? How is the package being used by Australian Synchrotron IRM Users? MASSIVE is being used to computationally model and correct for light scattering effects in Fourier Transform Infrared (FTIR) spectra and hyperspectral FTIR images of biological tissues and cells recorded on the Infrared Microscopy beamline at the Australian Synchrotron. RMieS-EMSC correction of FTIR images and spectral libraries can reveal previously hidden information on the variation of chemical constituents within the samples and can lead to improved classification of the samples’ chemical composition. The MASSIVE High Performance Computing facility allows RMieS-EMSC correction to be performed around 60 times faster than is possible on a typical high-end desktop PC. The extremely rapid RMieS-EMSC correction made possible by MASSIVE significantly reduces the time spent on analysis of synchrotron FTIR microspectroscopic images and datasets. Some examples of AS infrared microscopy beamline User-lead research projects that have using MASSIVE include studies in the areas of; malaria diagnosis, understanding the effects of radiotherapy for cancer treatment at the cellular level, stem cell therapies, IVF research, climate change effects on microalgae in the Southern Ocean, omega-3 fatty acids content in marine micro-fungi and soil fertility. To join sign up to the Project ASync009 on MASSIVE. New MASSIVE users can request to join the existing ASync009 project here. Existing MASSIVE users can request to join ASync009 project here. Once your account has been confirmed, please download and install the RMieS-EMSC software client below. For large datasets the MASSIVE high performance computing facility enables RMieS-EMSC to be performed up to 100 times faster than is possible on current desktop PCs. User friendly. The MASSIVE desktop, SCP, PuTTY and related software are NOT required. Available for 64 bit and 32 bit (may be deprecated soon) versions of MSWindows. 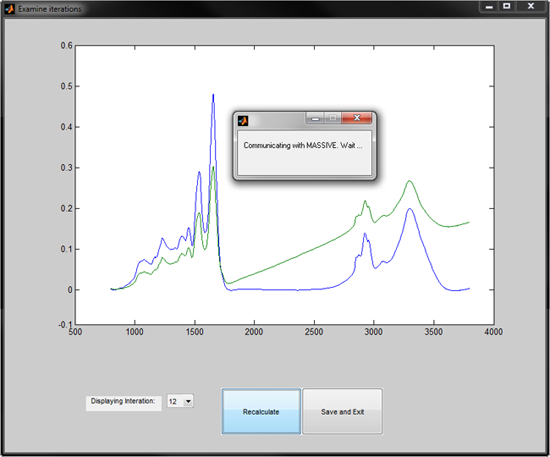 Accepts and outputs FTIR spectra in many popular data formats, allowing further multivariate data analysis. Full step-by-step User Guide provided. Single spectrum preview plotting function. This work is supported by the Multi-modal Australian ScienceS Imaging and Visualisation Environment (MASSIVE) (www.massive.org.au). Bassan, P., Kohler, A., Martens, H., Lee, J., Byrne, H. J., Dumas, P., … Gardner, P. (2010). Resonant Mie scattering (RMieS) correction of infrared spectra from highly scattering biological samples. The Analyst, 135, 268. P. Bassan, A. Sachdeva, A. Kohler, C. Hughes, A. Henderson, J. Boyle, J.H. Shanks, M. Brown, N.W. Clarkee and P. Gardner, FTIR microscopy of biological cells and tissue: data analysis using resonant Mie scattering (RMieS) EMSC algorithm, The Analyst, 2012, 137, 1370.